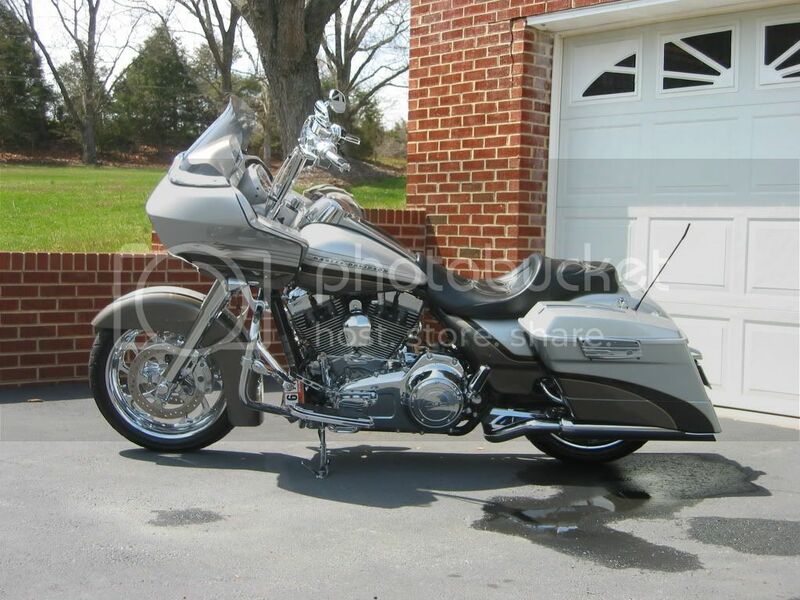 Are you keeping your 2009 CVO ROAD GLIDE. Re: Are you keeping your 2009 CVO ROAD GLIDE. I can't seem to post any snaps form my IPad. BTW- How's your GMR Slayer been treating you as of late? Selling ? I just bought it 6 weeks ago. I plan on keepin' this one for a long time. I love the looks. I would probably bought this one even without the 110 motor. Boy, for the last 8 yrs I've looked at the CVO Road Glides and I just can't find anything that would make me want to buy a new one. Sure, it would be nice to have a new motor. But I rode one and with the engine work I've had done, it runs better than the new 107's. Can't speak to the new 117's. And the colors/trim just haven't done anything for me------for 7 yrs. I'm a chrome guy and now they have eliminated chrome. So I don't forsee me buying a new bike, probably ever. I can rebuild the motor a few times if I need to and still have the best CVO Road Glide they ever made. I was at the Pilgrim Rd. plant over the weekend and H-D was offering test rides on their entire 2018 line up. The only one I rode was a 2018 CVO Road Glide. I own a 09 CVO Road Glide and am lovin' it. I bought it for $19,000 a few months ago and just for a grin I rode the '18. At $41,000 and change there is no way in the world I would be able to part with another $22,000 for another motorcycle that in no freekin' way is worth that much more jing over what I own now. Heck I just got mine and it's not going no where. My 2016 RGU is stationed in the rear of the garage, and I plan on keeping it in that order for quite some time.